The original Dan Armstrong designed guitars were made famous by Keith Richards of The Rolling Stones and Paul McCartney during his Wings period and many others. 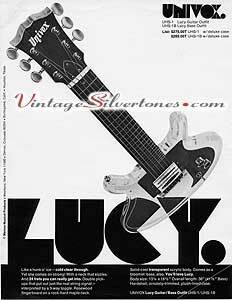 Univox created the Lucy (UHS-1), an excellent knock-off of the original, except their model has two pick-ups instead of one that slides in and out. You'd have to look really close at this one to know the difference. I've only seen four or five of these guitars so they're extremely rare especially in this condition.